Jeremy Clarkson eat your heart out. I’ve been trying out a means of executive travel that is quicker, maybe in the long run cheaper and certainly more exhilarating than the fastest of exotic vehicles you can get hold of. And before you tell me that you can’t smoke when in the Embraer Phenom (short for phenomenal? ), you can, assuming your fellow travellers don’t mind. The designers have contrived to incorporate a private loo into this four passenger very light jet (VLJ) too. I have heard that some passengers !!!! in their pants when being driven by your good self. Clarkson will probably not be impressed that Starbucks is the sponsor of the in-flight refreshments, but the on-board catering locker is very generous in size and liquor should not be in short supply. The problem with the Brazilian-built Embraer is that for Clarkson, and anyone of his size, it is a bit on the tight side. But saying that it is already proving popular with gangling Premier League footballers not short of a few bob. And personalities! The extremely comfortable little jet is ideal for “the star”, the manager, the publicist and “the friend”. The Brazilian’s nearly invented the aeroplane. Back at the end of the 19th century, before the Wright Brothers, a man called Santos Dumot had the aviation craze, and by 1906 was flying his own plane. The problem was Orville and Wilbur had got there first. A bit like Scot and Amundsen. Rush on 100 years and the Royal Princes are checked out on the Embraer’s Tucano, perhaps the best basic military trainer around today. Founded in 1969 Embraer is now the world’s third largest aviation manufacturer. From the same design studio comes the very popular Embraer 170, seen out of London City Airport and the Legacy, a large corporate express. When the Phenom was first announced in 2005 experienced aerospace executives raised their brows. Yes lightweight jets were all the vogue but did not Embraer have enough on its hands with the very successful e-series and its other various airframe projects. It was true that de Havilland of England had taken a similar route in an earlier era, but they are not with us any longer. Nor Eclipse Aviation who only three years earlier were talking about a build rate of 600 units annually at a price tag of less than US$1m – crazy economics. The Phenom 100 has also been joined by the Phenom 300, capable of carrying up to eight passengers further and at quicker speeds. It costs is at least twice as much as the current US$3.6m for the smaller jet. Embraer certainly has VLJ competition of which the $2.9m four-passenger Cessna Citation Mustang is the most serious with over 200 delivered. Coming along slowly is the bigger US$3.9m HondaJet – although initial deliveries of the carmaker’s aircraft have been put back to the last quarter of 2011. Two other manufactures, Piper and Diamond well on the way to producing aircraft and 260 Eclipse were delivered before the manufactures demise. They have not disappeared. 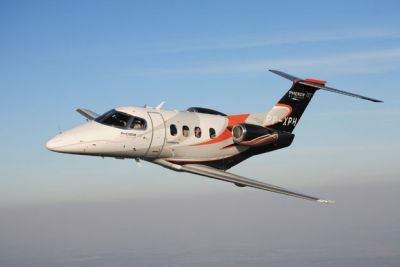 Perhaps the most interesting thing about the Embraer Phenom 100 is that it was always planned for the owner pilot. It is designed for single crew operation. But someone with a couple of hundred hours flying experience can’t just jump in the left hand seat and just take off. For the private pilot the business concept of owning the Phenom is to engage one’s own experienced professional crewman, allow him to give you command (that’s the word they use when you are actually flying the aircraft) from time to time, and when you are not using the aircraft contract in a first officer. The Embraer then becomes an executive jet and you can charter it out and get some of your money back. AERBT was delighted to take up the offer by the Oxford Airport-based business jet operator Flairjet to become the first UK journalist to fly in the aircraft. Registered G-SRBN after owner Simon Reuben (the other being G-DRBN taken from David Reuben – the two brothers the owners of the aircraft, and Oxford Airport). Flairjet says that the aircraft has been extremely well received with plenty of repeat bookings. In May a pair of Phenom 300 will join the fleet, under the same Rueben brothers arrangement. Flairjet is funded by three QC’s and has it own aircraft on order. There is an old saying in aviation. “If it looks right it will fly right”. It certainly looks right and once in the very comfortable BMW-designed cabin the world of luxury surrounds you, elegant and restrained. If you don’t want to just sit back and either read or go off to sleep a table easily comes out to offer a working area. No doubt in a short space of time the aircraft will acquire an in-flight internet system. OK the cabin is not as large as say the Hawker 800 (the former de Havilland 125) but it is a comfy fit. Airborne no nosier. And we are talking of a different league of price range and operating costs. You can of course lose the toilet and replace it with two more seats, but four up it is very comfortable. An ideal charter is Le Touquet for the day with luncheon at one of the wonderful restaurants the town is famous for, and later a flutter at the racecourse. £3,000 (plus the inevitable VAT) will easily cover for the four of you. If it is Geneva or Nice that is your destination both are well within range with a full compliment of passengers and some luggage. It will make Rome but with a reduced payload. The Embraer does need a 1500m runway and is not suitable for London City Airport. Cruising speed is over 400 mph and tops is 40,000ft, the province of the airliners, but ideal for sitting above the weather for a trip to sunnier climes. As was said in a famous interview “he would wouldn’t he”, but my Captain was most enthusiastic. “It handles beautifully and is a joy to fly”. Perhaps I should get my PPL back. Certainly the Garmin flight deck looks terrific with its three big screens and lots of digital offerings. Perhaps better known these days for its car navigation systems Garmin is establishment when it comes to light aircraft avionic fits. The flight deck personifies the aircraft. It’s impressive.